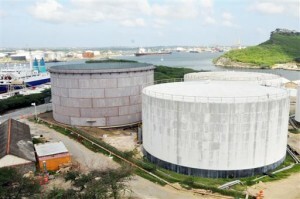 WILLEMSTAD – Gasoline and diesel prices are going up again on January 31. Gasoline price goes up by 9 cents per liter, thus from 1.52 to 1.61 guilders at the gas station. Diesel goes up by 12 cents, from 99 cents to 1.11 guilders per liter. Propane gas price again remains the same: 40 guilders for a large cylinder, 8 guilders for a small one. Starting February 1, Water and electricity will become a bit more expensive. The lowest domestic tariff for electricity will go up by about 4 cents up, from 48 cents per kilowatt hour to 52 cents. Water will go up by about 26 cents per cubic meter in the basic rate. From 7.39 guilders now to 7.65 guilders.